Architect Dale Stewart designed a cozy bungalow for his family in a Washington, D.C. suburb. 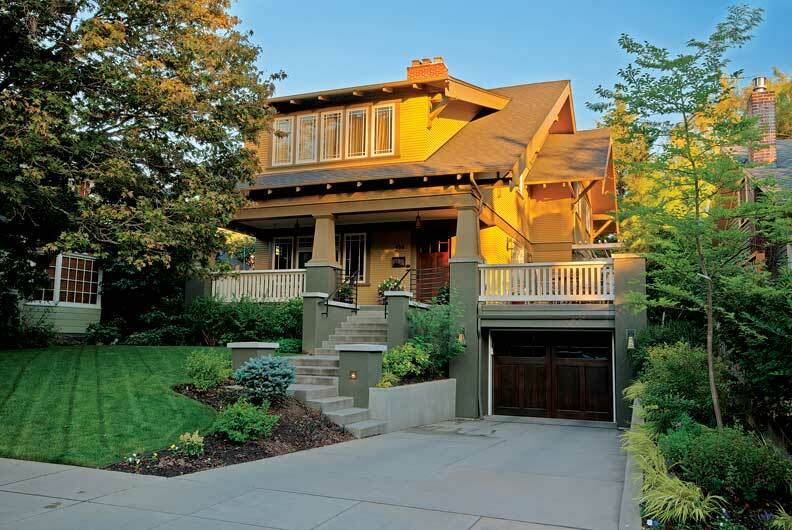 In a neighborhood of eclectic architectural styles, variety is a form of harmony. 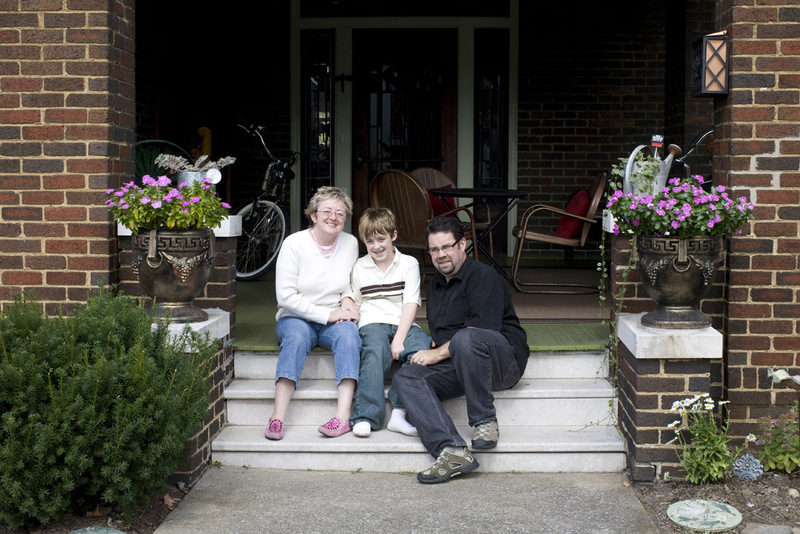 D.C. architect Dale Stewart, AIA, and his family had lived in the Seven Oaks neighborhood of Silver Spring, Maryland, for 17 years, and though they had outgrown their home, they didn&apos;t want to move. There were few open lots available for building a new home in the mature neighborhood of modest Colonial Revival, Tudor, and ranch-style homes, so Stewart, tapping his ingenuity as an architect, went to the county&apos;s Registry of Deeds and studied the neighborhood tax maps. He discovered that an oversized lot just two blocks away was actually two separate lots. The owner, who had lived in a house on the adjacent lot since the 1930s, was not interested in selling, but Stewart waited patiently until the house and both lots became available for sale and eventually acquired the empty lot. The stylistic variety of the neighborhood also gave Stewart and his family the freedom to consider any style for their new home. Stewart&apos;s wife, a native of Richmond, Virginia, was partial to the Colonial Revival style. Stewart&apos;s own inclinations tended toward the modern or contemporary. Searching for a style that would suit both of their tastes, they gravitated toward the Arts & Crafts style that became popular in England in the late 1800s, and, in particular, the variant of the style later popularized by architects Greene and Greene in California. For Stewart&apos;s wife, the style had the warmth and intimacy of a historical style, while Stewart enjoyed its bold geometry and clean, simple lines. It turned out to be just the right compromise, with both Stewart and his wife feeling that they had not given up the design qualities that were most important to each of them. On the exterior, the Stewart residence exhibits the hallmark details of California Arts & Crafts: asymmetrical forms with multiple gables, deep roof overhangs with exposed rafter tails, a sweeping wraparound front porch, a tapered stone chimney, and an interplay of heavy beams and trusses. The exterior surfaces are a rich pattern of wood shingles, clapboards, and ornamental wood beams and trusses, with strong horizontal lines uniting the asymmetrical composition. The combination of ornamental and load-bearing beams and trusses underscores the "tectonics" of the house—its structure. 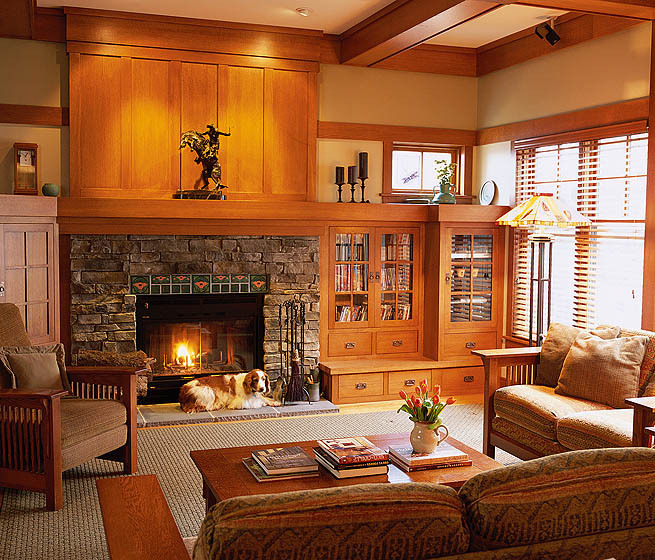 The great room features custom built-in cabinetry. On the interior, Stewart maintained the character of the Arts & Crafts style throughout the first floor with 10&apos;-high coffered beam ceilings, dark oak trim, Arts & Crafts light fixtures, and a massive sculptural staircase. 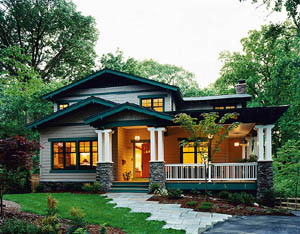 But Stewart took liberties with the floor plan to accommodate the lifestyle of a modern family, creating larger, more open spaces than might be found in a historical Arts & Crafts house and using a painting scheme that emphasizes the horizontal but that has a lighter than traditional touch on color. Traditional formal rooms, such as the dining room and library, are relatively small, while the rooms that the family actually uses every day, the kitchen and the family room, are comfortably large. The laundry room is located directly off the kitchen, so that all day-to-day activities can take place in the center of the house. In another bold departure, the wide stair is located on the first floor in the heart of the house, between the kitchen and the family room, and not in the front foyer. "Why have the stair connect the most public part of the house to the most private area?" asks Stewart rhetorically. "Instead, I chose to make a smaller grand foyer, with nice finishes and details, such as the tile floor and the built-in bench, and put the stair in the private part of the house." Putting the stair in the middle of the house meant very little wasted space for circulation, freeing Stewart to make the stair a grand focal point that unites all three floors of living space, from the garage, family room, and home office in the basement, to the light and airy bedrooms on the second floor. From that single, bold move, the layout of the house fell into place very quickly. Stewart draws a blank when asked how many design iterations the house went through. "I spent most of my time figuring out details, window placement, and so forth," says Stewart. "We ended up spending more than we had planned, but we couldn&apos;t bring ourselves to compromise on the details." At the same time, Stewart was careful to make the most out of available resources. The interior ceiling beams, whether ornamental or load-bearing, are rough or engineered lumber encased in oak-veneer plywood. The columns, however, which are available to touch and can be examined much more closely, are solid oak. Most of the kitchen cabinets are stock cabinets arranged in an Arts & Crafts style, complemented by a custom-made island. Stenciled walls and a built-in china cabinet dress the dining room. For stylistic consistency, the cabinetmaker, Carriage Hill Custom Cabinets of Frederick, Maryland, provided all of the interior millwork, including the stair. "It was a really nice process," says Stewart, "because as an architect I was able to sit down with the craftsmen and work out every detail." On the second floor, Stewart economized by using a more conventional quantity of paint-grade trim instead of extensive clear-finished oak, which lends the second-floor rooms an airy treetop feeling. Another departure from the traditional Arts & Crafts style is the home&apos;s lighting. "Lighting was very important to us," says Stewart. "We didn&apos;t want the house to be dark, like so many Arts & Crafts houses are. Strategically placed low-voltage lighting allowed us to do a lot of things that were not possible 100 years ago." Though the Stewart residence is much larger than neighboring homes, Stewart was eager to maintain a scale consistent with the neighborhood. The lot slopes away from the street, so that allowed him to put the garage in the basement at the rear of the house, which is the same width as its neighbors but much deeper. 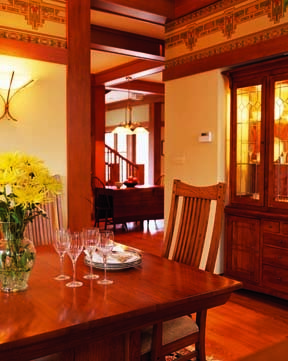 The Arts & Crafts style provided a rich palette of design elements to moderate the home&apos;s scale. The roof steps back from the front to break down the overall form, and oversized doors and windows make the house appear smaller than it actually is while admitting a great deal more light into the interior than is commonly found in a traditional Arts & Crafts home. 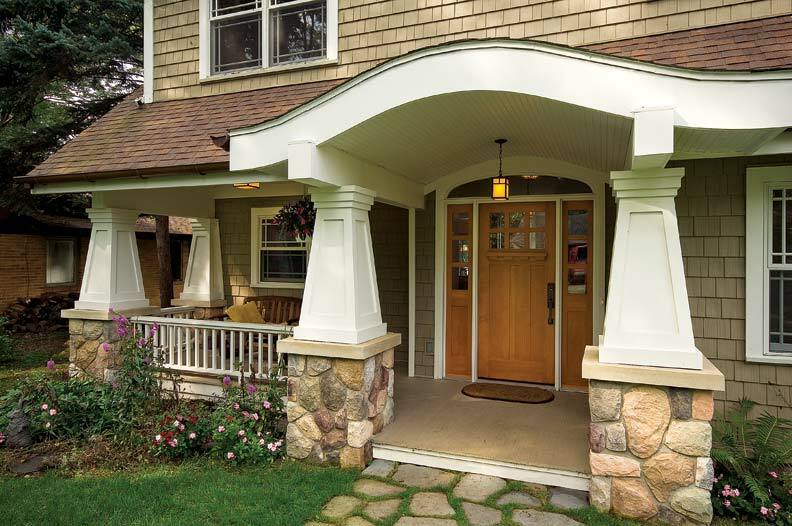 The roof of the front porch, too, successfully reduces the overall visual mass of the house. It took Stewart nearly a year to design the house, working evenings and weekends. "That&apos;s the luxury of designing yourself-no fee and no deadline. You can let ideas sit for awhile. Because we had time to mull things over, looking back, I don&apos;t really think there is anything that we would have done differently." Michael Tardif is a freelance writer living in Bethesda, Maryland.